If you thought you needed a Blu-ray recorder in order to burn high-definition discs from your home movies, think again. Toast 11 Titanium, together with the High-Def/Blu-ray Disc™ Plug-in (included with Toast 11 Pro), can burn HD video directly to standard DVD media using your regular DVD recorder, complete with customizable menu themes and navigation screens! These special AVCHD discs can then be played back on your Sony Playstation® PS3 or most set-top Blu-ray players, for viewing on your HDTV's big screen. Of course, if you do own a Blu-ray recorder, Toast 11 can burn to Blu-ray Discs as well. If you've watched Blu-ray movies played on an HDTV, you know how breathtaking the quality can be. There is simply no comparison between the detail you get with full 1920-by-1080 HD video and standard 720-by-480 DVD resolution. And now that HD camcorders and DVRs are plentiful and affordable, more people are recording their home movies and TV shows in high-def. Even the iPhone 4 can record 720p HD video (1280-by-720 pixels). So how do you get your home HD recordings onto your TV screen? External Blu-ray recorders for Macs have become affordable, but even if you don't want to buy one, the answer is as close as Toast and your DVD burner. You can fit up to an hour of HD video on a dual-layer DVD, which is plenty for most home video productions. With a Blu-ray recorder, you can also burn hours of video onto BD media. Even better, Toast lets you crop and trim your HD video, so you can edit out segments you don't want and conserve disc space and processing time. The same thing goes for HD recordings you make using Elgato's EyeTV or other TV recorder, so you can burn your favorite HD shows onto DVDs that will play back in your set-top Blu-ray player. 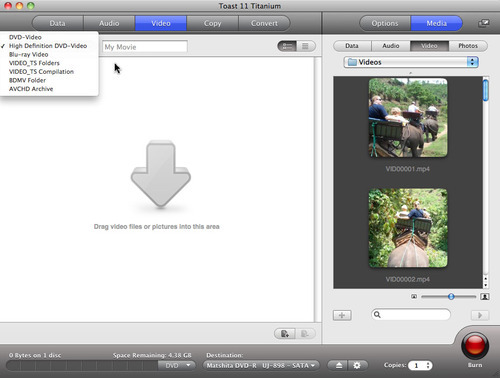 To create a high-definition DVD, first open Toast 11 (make sure you have the High-Def/Blu-ray Disc Plug-in installed) and select the High-Definition DVD-Video or Blu-ray Video project option under the Video tab (you can also choose these options from the Toast Assistant under the Video projects tab). Now bring in your HD video clips. 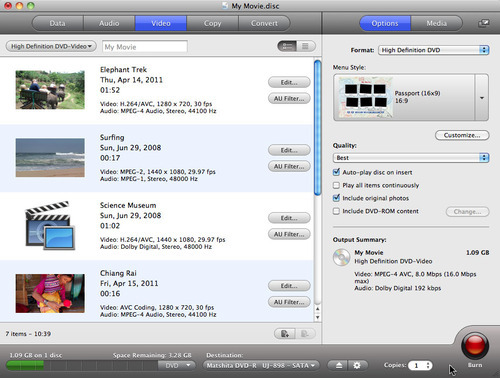 Click the Media Browser tab at right, and select clips already on your hard drive, or use the AVCHD option to import movies directly from your attached AVCHD camcorder (which should be in computer connection mode). 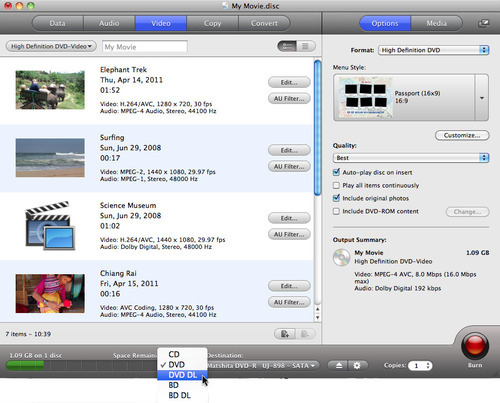 You can even choose TV recordings from your EyeTV or TiVo folders. 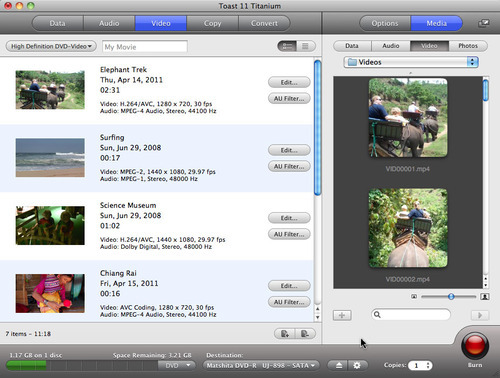 Choosing the High Definition DVD-Video project in Toast 11, with the Media Browser at right (click to enlarge). Video clips in the Toast Project window. The first and third clips are from two different AVCHD camcorders (note the different resolutions), the second clip is from an HDV camcorder. Toast can burn these all to one disc seamlessly (click to enlarge). Each clip is labeled with valuable information, including the date recorded, the length, and the encoding format (such as H.264/AVC 1920x1080, 1440x1080 or 1280x720 for AVCHD clips, and MPEG-2 1440x1080 for HDV camcorder clips). 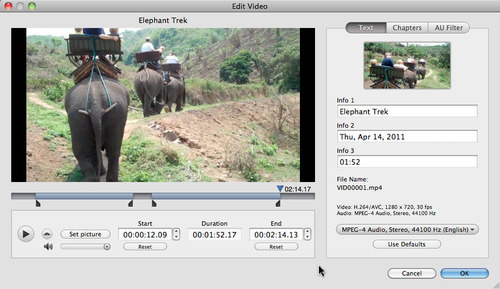 Editing a video clip in the Toast 11 Project window (click to enlarge). Here, you can do several things. You can change the default name and date of your clip, set the thumbnail picture, add chapter markers to longer videos, apply audio effects, and crop and trim your video. The clip name and thumbnail picture will appear in the navigation menu shown when you pop the disc into your set-top Blu-ray player. To trim the beginning and end of your clip, look at the slider below the video and drag the two trim markers at either end to their desired positions. (You can also enter specific start and end times in the boxes below the video.) If you'd like to crop out a portion from the middle of the clip, move the play head at the top to the beginning of the area you crop, then click the little upward triangle just to the right of the Play button. This will insert a new pair of trim markers that you can drag to define the area you want to crop out. When finished, click OK. Editing is nondestructive; your original video will be unaffected. Now that you've imported all your clips, trimmed any unwanted portions, and given them descriptive names, it's time to finish up your disc. Make sure the clips are in the sequence you'd like them displayed on your disc menu--just drag them up or down to change the order. Next, click the Options tab at top right to bring up the disc options. You can select a menu style, choose the encoding quality, decide whether you want the disc to start playing video automatically on insertion, and include any original photos, among other options. Click the Customize button for even more settings. Setting disc recording options (click to enlarge). Now you're all done, except for burning! The bar at bottom left will show how much video you have, and whether it fits on your disc. Choose DVD or DVD DL as the disc type if you have a DVD drive, and BD or BD DL if you have a Blu-ray recorder. Choosing the DVD or BD disc type (click to enlarge). If all is in order, click the red Burn button, insert a blank disc, and wait while Toast performs its magic. You can then pop your disc into most set-top Blu-ray players and enjoy high-def home movies on your HDTV!